John Rodriuez, Starr County elections department Elections Administrator, pulls a mock voting card from the voting machine as he demonstrates their new equipment at the El Cenizo Park building on Monday, Oct. 8, 2018, in Rio Grande City. The Starr County elections department is holding trainings for the county’s new voting machines two weeks before early voting begins. The machines were purchased earlier this year, updating the county’s machines for the first time in about 14 years. John Rodriguez, the county elections administrator, said the machines work the same way the old ones did except the equipment is better and more modern. 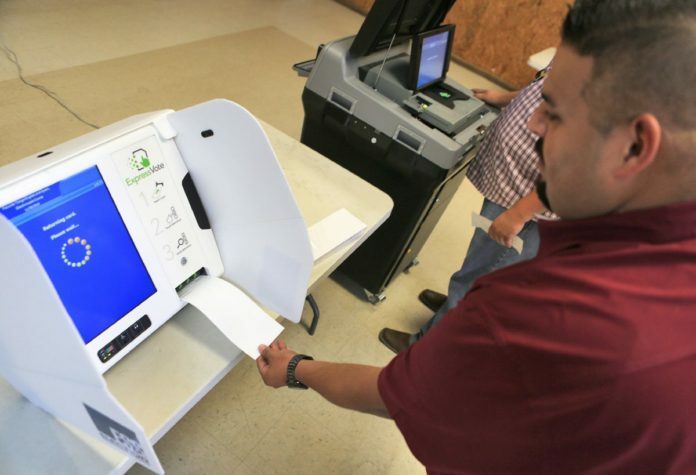 “These are way better and that’s why we wanted to do this — for the community, for the voters — so they can come in and be familiar with these new machines so they won’t be afraid of them when it comes to election time,” Rodriguez said. The only difference with the ExpressVote machine is that it will print out a sheet with a voter’s candidate selections which the voter will then submit to the other machine, the DS200 scanner and tabulator machine. The county purchased 22 of the DS200 machines and 20 of the ExpressVote machines from Election Systems & Software for about $180,000 which the county will pay for over a period of five years. Trainings for the machines will be held through Thursday this week at various sites throughout the county. Registered voters are invited to stop during a three-hour window to ask questions and try out the machines for themselves.